A Boreal chickadee was a surprise visitor to columnist Ann Brokelman's winter bird feeder. Photo by Ann Brokelman. Perhaps my biggest guilty pleasure, aside from my photography of course, are my bird feeders. I regularly purchase salt free peanuts, black oiled sunflower seeds, fresh suet, premium bird feed, and niger feed. So, why do I do it? Probably the same reason many of you keep a simple bird feeder in your yard as well: the joy of watching birds. 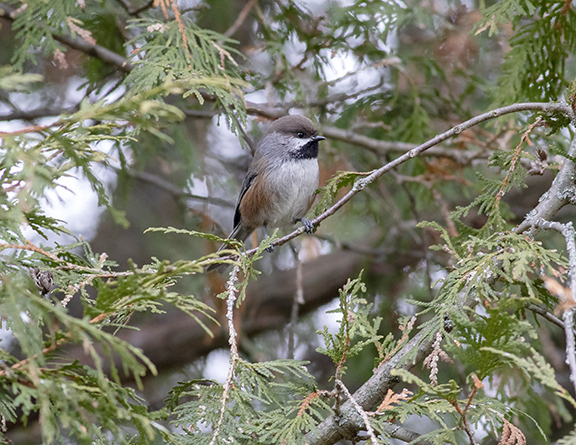 This winter the first birds to arrive included three types of woodpeckers, several northern cardinals, pine sisken, black capped chickadees, house finches, white crowned sparrows, eastern towhees, and many more. But one little fellow made this last season exceptional: A Boreal chickadee, (Poecile hudsonicus), which started showing up after the first few cool nights in November. My first sighting was during the day while sitting in my chair with my trusty, and excessively lazy, beagle Rory. I saw something at the peanut feeder, a bird that wasn’t one of my regulars, and with considerable effort I got Rory off my lap and grabbed my binoculars. I didn’t get a great look from that angle, so I took my camera and went outside. It took almost two hours before he came back and I was able to confirm he was a boreal. Bigger than our normal black-capped chickadees, the boreal is about 13-14 centimetres long and has a brown cap and chest, with rufous flanks. You might also notice that he’s unique because of his call: a very nasal chick-a-dee-dee-dee, almost like a regular chickadee with a cold. The boreal decided my peanut and black oiled sunflower seeds were his favourites and would often disappear inside the feeders. In between sightings at the feeder, I would regularly see him at the top of one of our front yard trees looking for seeds in pine cones and for bugs and insects on the twigs and needles. For the first month I would only see him for five to 15 seconds at a time before he’d fly away. The Boreal chickadee lives in the spruce forests of the North, and very rarely comes south of Algonquin Park. The boreal has a well-deserved reputation as an excessively elusive bird, which I totally agree with! As the months passed, he began to stay longer and longer, and even as I’m working on this story I can say I’ve had him visit in the last week. I have been told he should be on the move shortly to head north. For little moments like this, and as long as I can afford it, I’ll certainly continue keeping my bird feeders well stocked.